VetUK Joint Supplement Tablets are a complementary supplement for dogs and cats to support their normal joint function and mobility. Reduction in normal joint movement especially older dogs where loss of smooth cartilage in a synovial joint stops protecting the end of their bones. VetUK Joint Supplement can be given directly by mouth or mixed in with their normal food, and should be used as part of a regular exercise management regime. For the first 4 to 6 weeks give 1 tablet daily per 10kg of bodyweight. After this period, the amount should be halved. My 10 year old labradoodle is a bit stiff but these do seem to help and are great value for money. Tablets are quite large and she's not keen on taking them alone so I buy a cheap 50p tub of ASDA's pate every week or so and hide them in a spoon of it each time.. She now begs for her tablets! I've got to say this joint supplement is brilliant,works great for my adopted ex racing greyhound. straight away our 3yr old lab - shepard cross showed no signs of limp behaviour after her fly ball excercise, she's on these for now for life. Still waiting to see the results but, after reading the reviews, I am hopeful for my eight year old bull mastiff. My only gripe about these tablets is, even though my dog eats ANYTHING I just cannot get him to eat these. I have to give him six a day at the moment and am having to buy meat in which to hide them. He is actually getting wise to this and is licking all the meat off them and leaving them all in the bowl!! Couldn’t they have been made a little tastier? Sadly my cat won't eat them at all. I've tried offering him the portion of the tablet and crushing it and stirring into his food- complete refusal! Great product. Ingredients very good and my dogs are doing extremely well on them. However packaging very wasteful. Very easily 3 times as many tablets could fit into this container. That's why I've knocked one star off. We are so pleased with this product! Our old 14yr old border collie is a different dog since we started giving her these tablets just a month ago! Instead of sleeping most of the day she is now up & around & taking an interest again! She had a stroke almost a year ago & the change in her is excellent - we do have to wrap them in something 'treaty' so she'll take them - but well done Vet Uk! 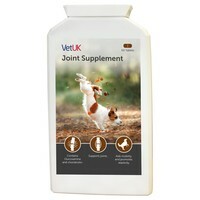 Having used Yumove on my elderly dog I decided to try your VetUK Joint Supplement and it's brilliant. He's a 16 year old pom/pap cross and while he's obviously still frail he's obviously enjoying life, playing like he hasn't done in a long time. It's making his final months (years) a lot happier. I can't thank you enough. I read previous reviews but never really thought the difference would be that noticeable, but it is! I can't recommend these tablets highly enough. Tootsie is like a different dog, she is so much more lively, generally seems a happier dog. My 10 year old Golden Retriever had started to slow up so our Vet recommended these and they have given him back his zest. He's been on them for about a year and is much more mobile, excellent product, well recommended. This is a really good product. My dog's vet recommended it and at her last check up her had improved. There is lots of info on the internet about the effectiveness of the ingredients which has prompted me to start using the human version! Also some very good and conclusive studies about turmeric. I like Indian food and also cooking with turmeric so now put it in even more dishes. As to Vet UK, very fast and reliable service and MUCH cheaper than buying exactly the same products at my vet's surgery (I have also started buying flea and worming products). I don't have a lot of money but do love my dog and take good care of her and do spend what is needed for her well-being, so it's great to find a company like Vet UK. Thanks!